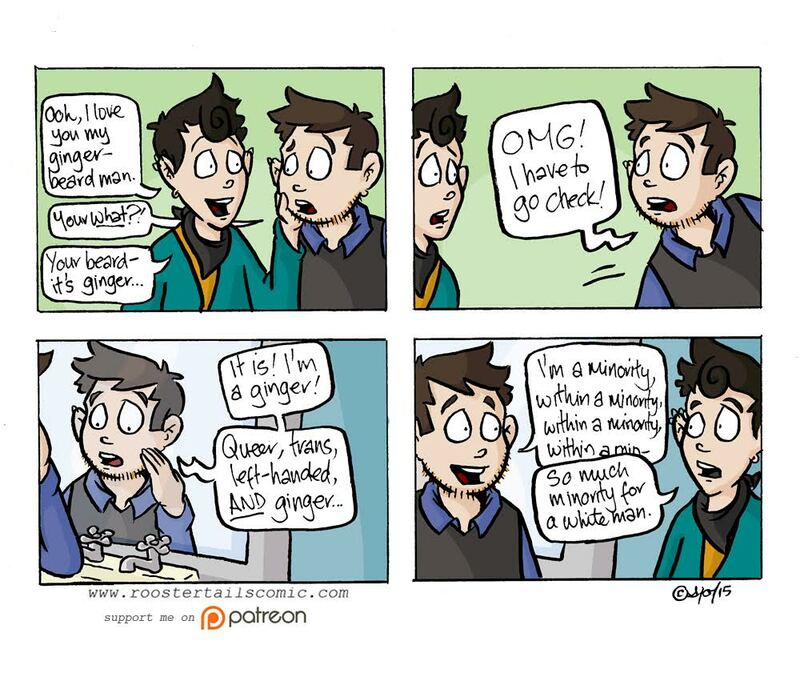 Sam Orchard is a New Zealand based self-described ‘geeky transguy’, and author of webcomic Rooster Tails, a weekly autobiographical comic of his life as he transitions. Kirsty Webeck caught up with him to discuss his work. KW: You’re the mastermind behind Rooster Tails webcomic, tell us all about it! SO: Rooster Tails is an autobiographical webcomic about myself and my partner, and our cat. It basically came about because I was trying to find depictions of queer and trans people that didn’t scandalise us, or have us dying or killing people – and, sadly, there’s surprisingly few examples of that in mainstream tv and films. So, because I’m not rich enough to make my own TV show or movie, and don’t have enough friends I could convince to act, I decided to draw comics about us, because I can.. kinda.. draw ok.
It’s a comic that’s been going for five years now, and updates (mostly) once a week, and, yeah, it’s about celebrating life and queerness and transness – and all the good things like that! It’s kind of a combo of a narcissistic “hey! look at me!” project, and an educational-ish “hey! difference is a good thing!” project. Me and my partner are both trans, but have pretty different ways of going about it, and different gender stuff going on, and we’re also pretty nerdy and weird – so there’s always plenty of things to draw about. KW: Who are your target audiences and why? SO: I originally started putting the comics online not really knowing who would read them – I figured if I shared them publicly it would force me to keep updating regularly. I thought it’d pretty much be (my partner) Joe – because I’d force them to look at it. I’m honestly really surprised about the breadth of people who read it – it’s a whole mix of trans folk, cisgender folk, queer folks, straight people, parents, kids, a real mix. I think I probably do it mostly for people like me, people who want to see positive representations of trans people, and nerdy queers, but I think a lot of non-queer and cis people read it too, which is really cool. KW: What or who inspires you? SO: Oh man, so many people! In terms of comic people I’m super inspired by the work of other queer webcomics people like Erika Moen, Tab Kimpton, Blue Deliquanti and so many more – Sfe Monster, RJ Edwards, Christine Smith – I could go on and on. I also love Allison Bechdel, Howard Cruse, and Liz Prince. I like stories that try to undo or complicate some of those ideas that we’re told like as queer or trans people, stories that celebrate our diversity, and differences. I get really bummed out when there are stories about LGBTQIA people and the crux of the story is all about how “we’re just normal people after all” – I love our differences, and I think being different, in whatever way, is so important to celebrate. KW: What are your future plans for Rooster Tails and your comic career? SO: I’m really excited about my ‘Family Portraits’ series, which I printed the first three issues of last year. It’s a collection of short stories, told in different comic styles, about different folks living in New Zealand, and their experiences of gender and sexuality. I feel really lucky to be able to share the stories of some really epically impressive people. I’m working on issue four at the moment so hopefully it’ll be out next year!